The City of Plainville, located in Rooks County of northwest Kansas, is offering free lots for the construction of new homes. The North Town Addition project will give people a chance to build a home and live in a small-town atmosphere, and at the same time, have big city conveniences not far away. Plainville is a city of just over 2,000 people in a county that has a population of around 5,100 people. Major industries include: oil production, agriculture, truck trailer manufacture, health care, and furniture design. Explore the Rooks County website to find out more about what Plainville and the other communities of the county have to offer. Currently, one building lot is still available on a first-come, first-served basis in the North Addition. Additional lots are now available in an area bounded by Colorado, Wyoming, 2nd, and 3rd streets in west Plainville. The lots are approximately 155 feet wide and 93 feet deep and are located in the Plainville North Addition. Homes must be new construction. All homes must be on a full foundation, whether stick-built or modular. No single wide mobile homes. An agreement will be entered into between the City of Plainville and the Buyer. The agreements specifies that the Buyer has six (6) months to enter into a contract with a building contractor to build a single family residence on the property. Construction on the home must begin within twelve (12) months of the date of the agreement, and construction must be completed in eighteen (18) months. The city requests that you meet personally with the city council at the time you apply, or soon afterward, so they can meet you and approve the plans for your home. The plans and specifications for the home must first be approved by the City Council. A $500 deposit shall be paid to the city. This deposit will be refunded to the Buyer at the time of closing provided that the Buyer has performed all of the covenants contained in the agreement and all terms of the contract have been completed. After completion of the terms of the contract, the property will be deeded to the Buyer at the time of closing. Rooks County has a Neighborhood Revitalization Plan that will provide for the rebate of the property taxes on the new house (and any additional structures such as outbuildings) on a declining scale over a 10-year period. A homeowner would realize at least a 50% property tax saving over a 10-year period. (To read the specifics about this program, click the link above). In addition, because the infrastructure is in place, there are no special assessments added to the property taxes. The owner is responsible for bringing utilities to the house, however. To receive an application, you can contact the Plainville City Office at 785-434-2841. Applicants should take care to carefully read the application before submitting it to the Plainville City Office. Jobs available in Rooks County. This is only a listing of jobs available in the county and does not include available jobs in Hays, a community of over 20,000 people located 23 miles south of Plainville. Complete business listing, including banks. 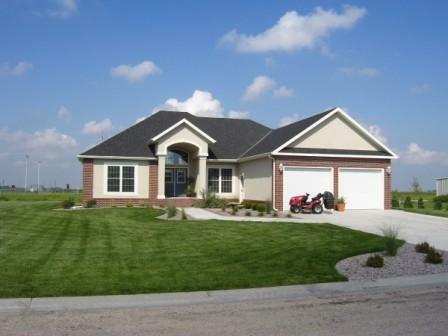 Kuhlmann Construction can show you an example of a house that could be built on the land.